Stand at attention, hand on heart, bow your head – what are you supposed to do during the national anthem? The varied display you get every time the anthem plays would make you think that anything from standing at attention to breaking out into an impromptu bhangra is acceptable. It is not often that people listening to the national anthem get airtime on multiple occasions over a three-month period. In this era of hyper nationalism and unnecessarily overt displays of patriotism, perhaps this is not entirely a bad thing. However, with the recent oath-taking ceremonies, Independence Day, Defence Day and the Asia Cup coming in quick succession, we’ve been blessed with (or subjected to, depending on your perspective) something approaching an overload of this. One remembers, of course, the brouhaha across the border on people not standing up for the national anthem which, apparently, is played before every movie in the cinema, and I don’t want to stir a similar controversy here. However, the varied display you get every time the anthem plays would make you think that anything from standing at attention to breaking out into an impromptu bhangra is acceptable. And you probably wouldn’t be entirely wrong. 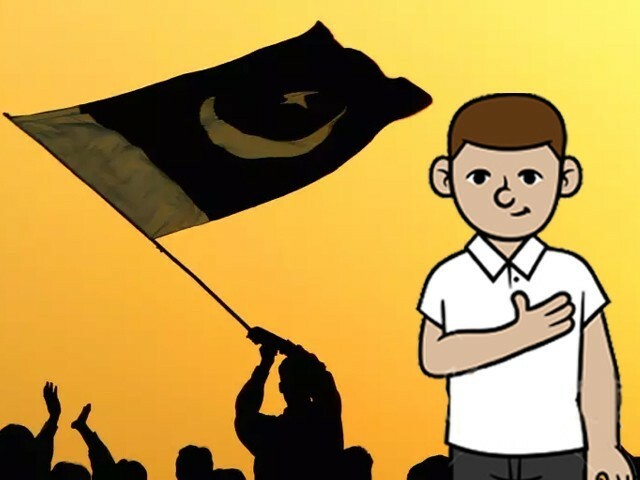 A cursory Google search will not lead you to a published salute or etiquette code for the flag or national anthem of Pakistan – and I’m willing to bet we probably don’t have an official government sanctioned one for civilians. Neither are the codes of conduct and etiquette for the various military branches a part of the public domain. However, since our practice is more or less consistent with that of our colonial forbearers in the UK and our neighbours in India and Bangladesh, one can hazard a guess that the countless generals we’ve seen standing at attention and saluting are probably following the rules. So unless their heads are uncovered for some reason, you’d expect a proper salute for the duration of the anthem. Which brings us to the question of etiquette for civilians. Conventional wisdom states they would stand at attention throughout the anthem, and at least until a few years ago, this was the general practice (with a slight inclination of the head at the end – something we’ll get to later). This is probably what you were taught at school too, with none of the hand on the heart nonsense that is so en vogue these days. But what exactly the “right” way is happens to be the point of this blog, so let’s look at the facts. Pakistanis, from PM to newborns, need to learn the protocol for listening to the anthem. Hands by your side throughout (unless you're in uniform) AND NOT ON YOUR HEART. Green card nahin mila hai aap ko. And FFS, stop going into semi rukoo at "Zul Jalal". Chin up throughout. We didn’t officially have a national anthem until 1950, and from 1950 till 1954, we had an anthem without lyrics. So what little footage we have from that era of the anthem being played generally shows our uniformed personnel saluting and our civilians standing at attention. The bit where people incline their heads in respect of the name of the Almighty being invoked – Khudae Zuljalal – would obviously not have been the practice during that period, as nobody would have predicted that Hafeez Jalandhari would end the anthem with that. Once the lyrics were introduced in 1954, it seems this practice somehow became the standard – which is curious, as none of the other 98 names of Allah get the same respect in daily life and neither does this one when mentioned in any context other than the anthem itself. 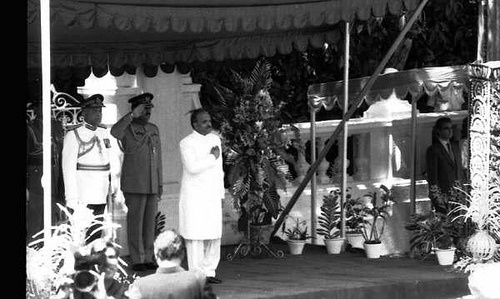 The first time anyone remembers seeing a Pakistani head of state with his hand on his heart during the anthem seems to be General Ziaul Haq trying to follow the same practice as Ronald Reagan. Ironically, Benazir Bhutto, the ultimate anti-Zia leader, has also been recorded using that mode of respect, and so have several heads of state since then. However, it didn’t get mass appeal until some members of the cricket team started doing the same. In the absence of a documented code of etiquette, it is impossible to say whether this practice is right or wrong, but there is no cultural or historical relevance to it, besides Zia trying to look cool back in the late 70s. And that raises the final question: should there be a code of etiquette for the national anthem outside of a parade ground drill? Or will that give rise to instances of patriotism policing like we saw across the border, something we have too much of already? Would you want to be told how to stand, where to place your hands, and how many degrees to bow your neck every time someone decides to play the anthem? All I do know is that if an obscure law defining how we’re supposed to be during the anthem does surface from somewhere, violators will probably be required to pay their fines to the dam fund. Until then, just keep doing what you’re doing. 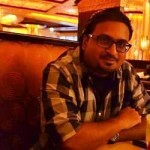 The author is a corporate governance professional based in the Middle East.